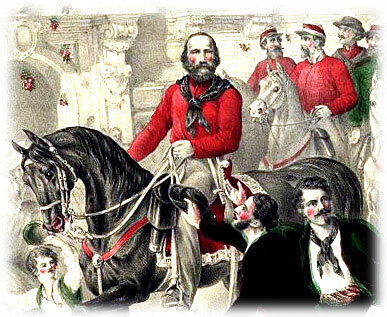 Garibaldi in his famed red shirt. So what effect did an Italian revolutionary have on 19th century fashion? The Garibaldi shirt or jacket of the 1860s owed its name to the outfit worn by the European revolutionary, Giuseppe Garibaldi. 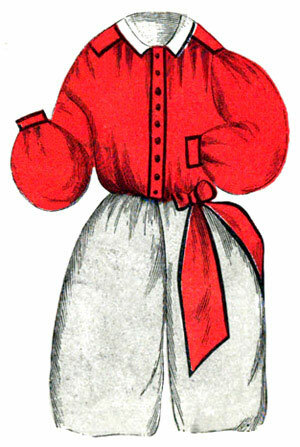 Notorious for its bright red color, the Garibaldi shirt was the forerunner of the modern day woman’s blouse. First introduced by Empress Eugenie of France in the early 1860s, the loose-fitting bodice was named after the Italian hero and was popular in both Europe and America as a comfortable garment for both women and children. 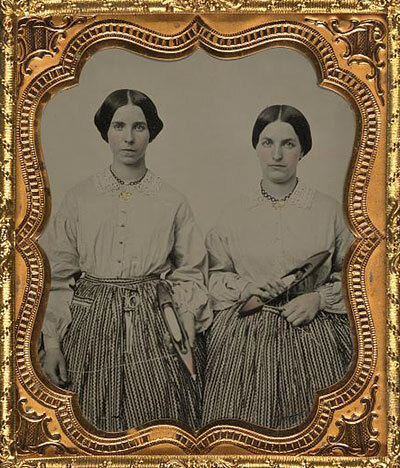 In 1862 Godey’s magazine declared that the Garibaldi shirt was “a change amounting to revolution in ladies’ costume.” In shape and pattern it was made in the same way as a Victorian gentleman’s shirt with pleats in front, extending just below the waist, with full sleeves and turned down cuffs. The shirt was made of one material, often in a printed flannel, merino, muslin de laine, printed cambric, foulard, or pique. 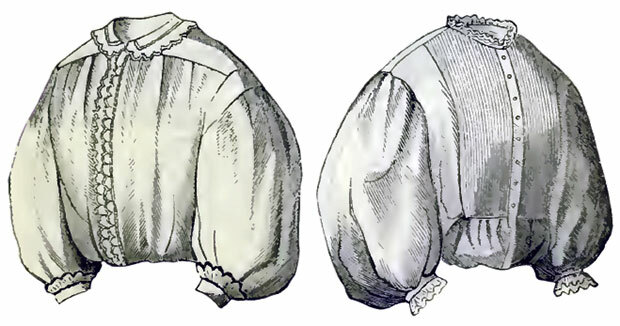 The ends of the Victorian shirt were left so as to be tucked underneath the skirt and still long enough to hang over in “bag fashion” all round producing a free flowing and graceful effect. The garibaldi shirt was considered a pretty garment for morning, breakfast, or demi-toilette. 1862 outfit for a young boy features the Garibaldi shirt. 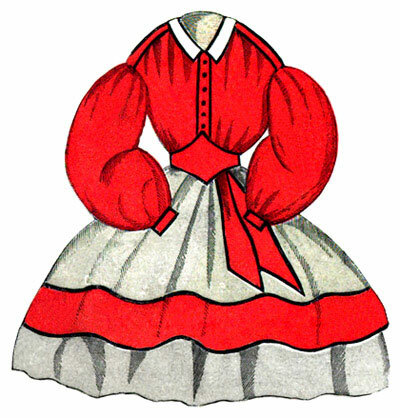 1862 outfit for a young girl includes the Garibaldi shirt. 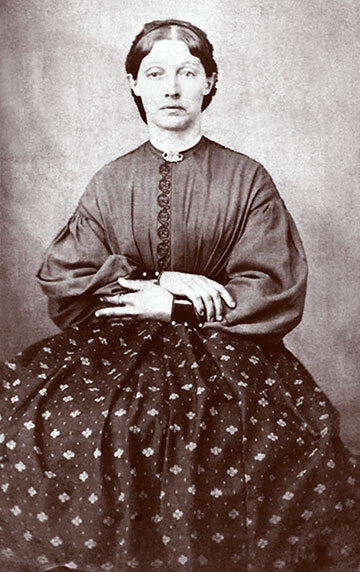 The early Garibaldi shirt was of bright scarlet merino, pleated in the front with black buttons, and braided in black with a turnover collar. 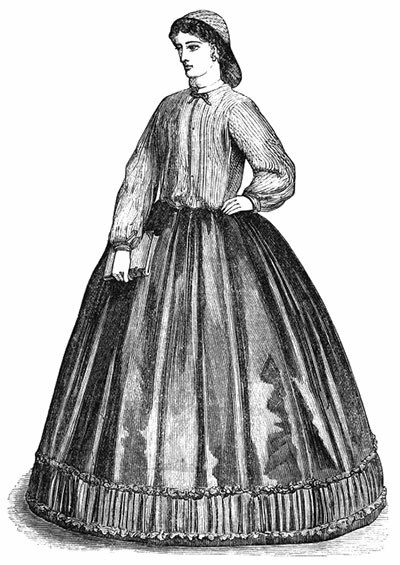 The Garibaldi style shirt was worn by women and young girls with a full skirt. Boy’s fashions also imitated the style, taking advantage of the loose-fitting comfort of the garment. 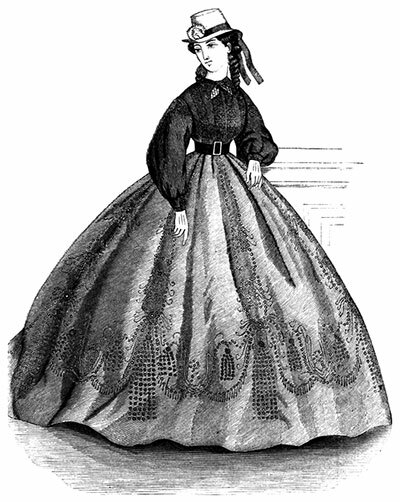 This Civil War era engraving features a steel-colored skirt that is stamped to resemble an embroidery of jet beads and a Garibaldi waist of blue de laine stamped to simulate braiding. Left: 1862 Victorian white Garibaldi shirt trimmed with scarlet braid and scalloped with scarlet cotton. Right: Victorian Garibaldi shirt from 1862 to be worn with a Zouave jacket. The front is like a shirt while the neck and wrists are finished with a double row of fluted ruffling.